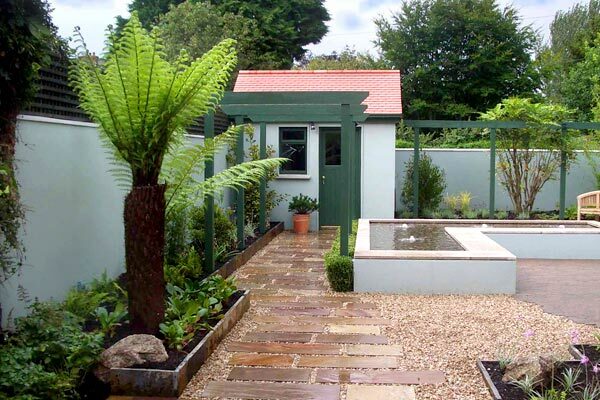 The design style of this urban Dublin garden is clean and contemporary. A blend of green hues and warm paving materials were used to create a textured and layered finish to the design. Plan Eden designed a large, raised, L-shaped water feature as the focal point of this garden. Bubble jets in the pool bring the sound and movement of water, and a relaxing atmosphere to the garden plan. The elevation of the water feature makes it child friendly, while its wide rim acts as casual seating. The base of the pool is lined with smoothe cobbles serving as a strong visual feature, further highlighted by lighting at night. 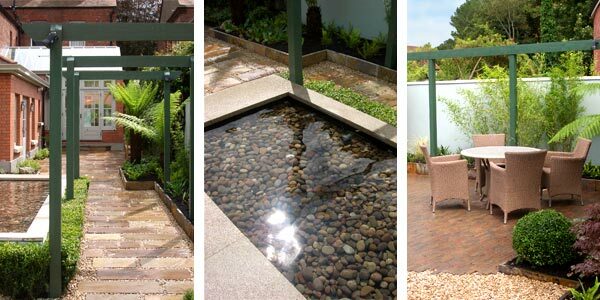 The sound and movement of the water feature creates a peaceful oasis in an urban setting. When planning this garden, Dublin designer Peter O’Brien used as paving, a combination of pebble, sandstone slabs and slim bricks to add interest and texture to the garden. The staggered edges of the main patio allow it to merge smoothly with the pebble, which is also carried around the sandstone flags . This combination of warm textures in the ground plane, ties in well with the red brick detailing of the house, while forming an essential element of the low maintenance garden design. The informal combination of gravel and varied paving softens their appearance while ensuring a low maintenance garden. The design uses timber pergolas to draw the eye upwards, creating a three-dimensional element to the garden. A pergola, constructed alongside the water feature, frames a view through to a focal point bespoke designed shed beyond. A varied palate of green finishes on the walls and woodwork creates a very clean, textured look when combined with the rich foliage of the planting. In terms of balacing the strong architectural features, a combination of formal box planting, focal point tree ferns, perennials and grasses were used to enhance, soften and clothe the structure.